It was about this time last year that we started working with the team at Southfields Academy on our first school programme. An integral part of our ethos is supporting the arts through the coffee business and starting to work with schools was an important first step we had in mind for a while. It's a programme we would like to roll out to as many of our wholesale customers as are interested. Aimed at GCSE level, the target is to open their eyes not only to the coffee industry but also, to the cultures and creativity to be found within it. We started with the commissioning or pitching brief – talking through the coffees we source, the countries and farmers we work with, our approach when roasting and finally the ethos behind the brand. We then briefed them specifically on the blend they would be working on branding - a teacher's brew - and the limits or framework for their designs. For example, the designs needed to work on our 1kg bags, the budget limited them to designs that would require only stamps for production and the labels and colours at their disposal. The ultimate aim is for the designs by the students at each specific school to be used at their schools for their teacher's coffee, roasted and supplied by us here at HHCo. The designers we partner with - Studio Hyte - went into the school to work with the students and feedback twice. Finally we were presented with a short list of works, you can see these at the end of the post, to select the winning piece from. We were amazed with the standard of research and work that went into these projects and we're delighted that these will form an integral part of the student's portfolios when applying for sixth form and beyond. Luke St Clair for research; Ihtasham Ahmed for concept; George Stacey for detail and finish; and Akeem Roye for experimentation. Finally, it was a tough call but Luke St Clair's work was produced and will be used all of the next academic year at Southfields Academy. The winning design is titled 'ENERGIA'. 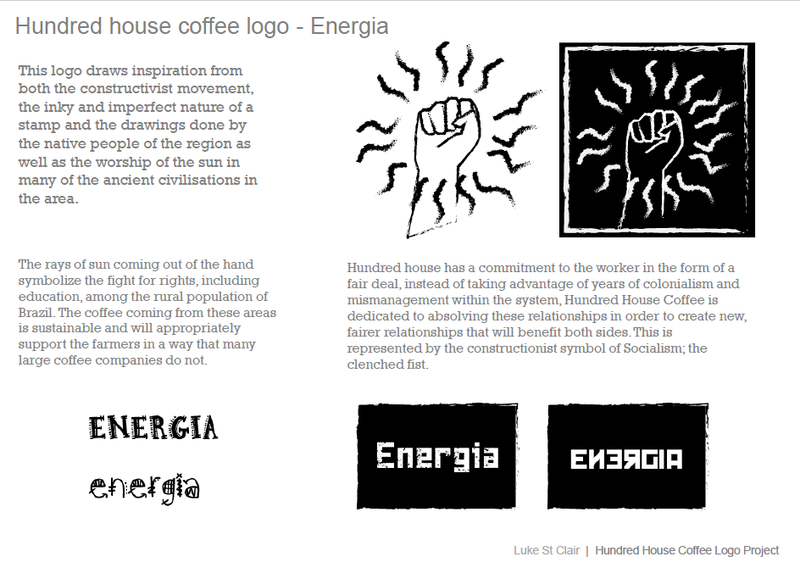 Taking inspiration from the origin of this teacher's brew, Brazil, Luke explored the sun worshipping rituals of ancient civilisations in the area, drawing inspiration from the constructivist movement. The rays of sun coming out of the fist symbolise the fight for rights, including education, among the rural population of Brazil. He used the clenched fist, an emblem for socialism, to highlight a commitment to fairer international relationships, benefitting both parties and ensuring fair deals for the coffee farmers. The finalists designs can be viewed below. Copyright belongs to the students, please do not use any of these works without the permission of HHCo and the student.